You forgot to highlight my aspect, which clearly says: "My friends met Woz, and all I got was this lousy T-shirt." I do note that Eric has clearly attended the same pocket-protector school as Woz. Is that like a school tie? You guys are gonna make me cry. I'm sensitive that way. No idea where Woz gets it from. 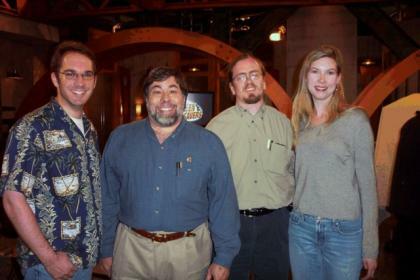 After this picture was taken, Eric actually attempted to wrest the pocket protector away from Woz. A scuffle ensued, and we were "shown out."